I knew a lot about MAMMA MIA!, but I've never seen it live. It was the best thing that ever happened to me! Now I knew what's the point in living: enjoying musicals like this. The cast was wonderful: Carolanne Weidle as Donna was spectacular!! I've seen the production twice in the days when they were playing in Budapest, unfortunately the second time it wasn't Carolanne playing, because of which I cried during "Money, Money, Money", but thank God, my favourite Sam: Cameron Blakely, sang "Knowing me, Knowing you" both times, and I believe he was singing it only to me, so don't you dare take that from me!! I personally liked it better with Carolanne, because she's a better actress other then singer and she and Cameron match very well as Donna and Sam, and her daughter Sophie (Katie Brayben), was a really good match: I could believe she was her daughter for real! Besides from the opening of the second act, where I was sure someone just teared my heart out and stepped on it (THAT IS SOME LOUD MUSIC THEY'RE STARTING WITH), I loved every little single detail. There's only one thing I would've liked to change: when they're singing "I do, I do, I do, I do, I do", and Sam "proposes" to Donna, I wish she would've said "I don't!" at first, then after a little more time spent on convincing her she says "I do!". MAMMA MIA! 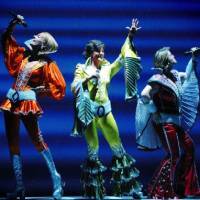 gives you a whole new vision on the famous ABBA songs, for example, I hated "Dancing Queen". I just couldn't stand it, but now I just have to visualize the part when the girls are remembering the old times as "The Dynamos", and I could listen to that song forever! I also love the changes in the songs: "Does your mother know", instead of chick and girl, kid and boy. Or "Mamma Mia", I've been cheated by you since I don't know when, I was cheated by you and I think you know when. That's funny. I loved it when Rosie (Morag Siller) and Tanya (Joan Walker), try to cheer up Donna with "Chiquitita", or the beginning of the second act were Sophie is having a nightmare and her possible dads appear, dressed up for the wedding. I especially loved "The winner takes it all", because we finally understand why Donna never told Sam or the others she was pregnant: she was afraid of getting hurt again. But I also loved it because we see that Donna is still in love with Sam. No wonder she said "I do", the first time he asked! "Take a chance on me", was hilarious. "Lay all your love on me", was beautifully funny. "S.O.S", was by far the most beautiful and not just because of Carolanne and Cameron (well actually, it was because of them)! "Gimme! Gimme! Gimme! ", was a the best dance coreography ever! "Knowing me, knowing you!, was beautiful: Cameron's voice is wonderful. I swear I cried! The only reason I wasn't so angry at the second cast, is because Nicky Adams (alternate Donna, I believe), sang "One of us", my favourite, in a beautiful way. She is very talented, don't get me wrong, but I don't think she matches with Cameron! There was a thing that wasn't quite clear: when Sophie tells Sky (Craig Adams, he's hot! ), that she invited her possible dads to the wedding and he gets really angry, he says he's not sure he wants to get married, but at the wedding they're making out as if nothing happened. What's up with that? I don't know about you, but I'm sure Sam is the real dad, because Harry (Tim English), and Bill (Jeffery Harmer), were just excuses for Donna to forget Sam, in which she didn't succed at all!! I was sorry, that Bill didn't sing with Donna, after all, he's the only one who promised to Sophie to talk to her, but I guess it's OK, because otherwise, it would've been weird that he already moves on to Rosie! I gotta add, that I listened to the original cast recording, and I hated that Sam's voice! He sounded like a woman! Come on, a good Sam has to be at least a little bit like Cameron Blakely, or it just doesn't work!! Well, I guess I said everthing. I just wish I had more money, so I could travel with the stars and watch the show every single night in a different country! I heard, that they're planning on returning to Budapest, in a year and a half, but I'm worried that the cast will change at least four times, before they get to my little country again, because without Carolanne Weidle and Cameron Blakely there is no MAMMA MIA!. If somebody asked me: if you had one single wish, what would it be? I would say: it would be to meet Carolanne Weidle, because I want to tell her personally that I love her voice and she's very talented, and that I'm her number 1 fan, which I am really proud of! Of course, my little notebook for autographs would be in my pocket! And if they change Carolanne to another actress I will never see it again!! !Because I agree with you "withouth Carolanne Weidle there is no MAMMA MIA!"